Twenty years later, the Downtown Victoria Business Association is still at it, adding more lighting to the Johnson half of the alley. The company that performed the work says the alley “is now more secure, better lit and more aesthetically pleasing.” Look at these well-lit “no loitering” signs! Lighting in Odeon Alley. Source: Lush Eco Lawns & Gardens. The most egregious piece of defensive architecture was installed sometime between 2014 and 2015, when the Odeon slapped bricks on top of a planter at the Johnson end of the alley. The bricks are there to stop anyone from sitting down. Odeon Alley planter with bricks. City of Victoria right of way over Cineplex Entertainment’s portion of Odeon Alley. Source: Statutory Right of Way document. The signs that clutter the Odeon side of the alley are there to remind you that unless you’re inside having paid $11.99 ($7.50 Tuesdays), there’s no stopping on Odeon property. 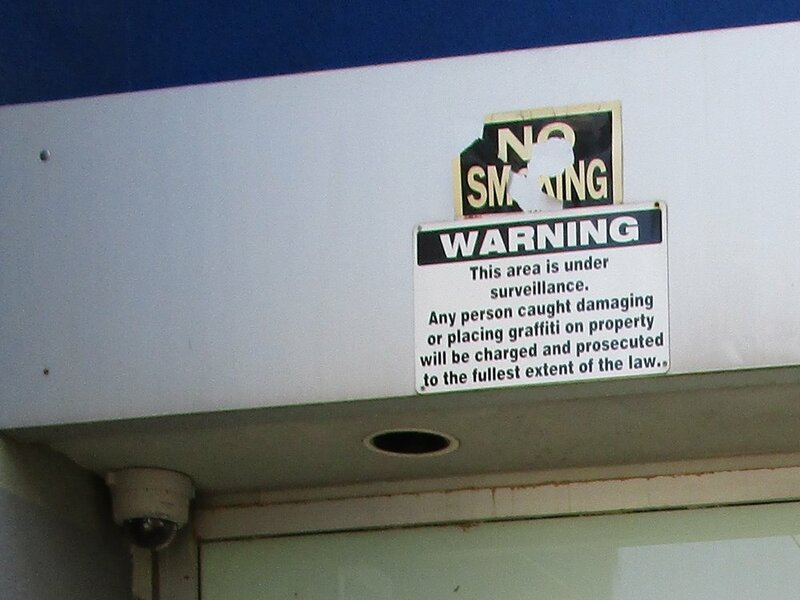 “NO LOITERING PRIVATE PROPERTY NO SMOKING!”; “PRIVATE PROPERTY. Absolutely No Loitering. Trespassers will be prosecuted”; “WARNING This area is under surveillance”; “ODEON ALLEY NO LOITERING”; and “CAUTION DOOR MAY OPEN SUDDENLY.” Okay, maybe that last one is just good advice. DVBA Executive Director Kerri Milton said she agreed with Loveday, but things like the planter “predate any of us, because they’ve all been there, and those are things that we need to address.” It’s true that businesses have been installing defensive architecture in the alley since at least 1997, but three-quarters of the DVBA Board was the same in 2014-15 (when the planter was bricked off) as it is now. Over the years, businesses reported devoting a lot of energy to cleaning up the alley. Along the way they’ve installed lighting, put up aggressive signs, and bricked up planters to keep people away. Those are all choices, and I think they are harmful choices. At the same time, I acknowledge that it’s government decisions that continue to leave people in poverty, and continue to leave drug users without access to life-saving services. The fact that businesses, volunteers, social service workers, and philanthropists are left to respond to our governments’ systemic failures is shameful. The large-scale choices made by our governments – slashing investment in social housing, for example, and setting poverty-level assistance rates – do more widespread harm than a theatre chain bricking up a single planter. While we can and should fight for systemic change, however, we do have some control over what happens locally. When an apartment building installed spikes to stop people from sleeping outside in London, England, for example, 130,000 people raised hell (including the mayor), and the spikes were removed. Victorians shouldn’t become complacent. People should not be able to walk past these things and think of them as an acceptable response to poverty and the criminalization of substance use. If Victorians and the DVBA want to make people feel welcome in Odeon Alley, they should tell Cineplex to take down the signs and toss out the bricks. It’s a start. This post focuses on defensive architecture on Cineplex Entertainment’s half of Odeon Alley. I plan to look at the other half of the alley (owned by the City of Victoria and Concert Properties) in a future post.